A new logo, promotional materials, website (www.MyHSE.org), and a strong social media initiative, are in place to answer, “YES! The diploma is still available.” However, the GED credential has a new name in Indiana and is a different test. The new name for the GED in Indiana is HSE. 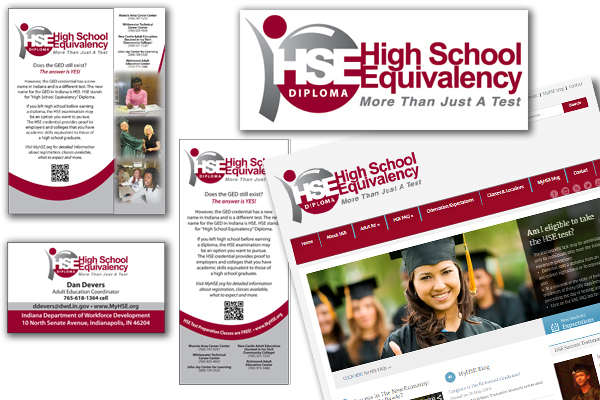 HSE stands for “High School Equivalency” Diploma. “Region 6 Adult Education Consortium chose to market programs due to similarities in programs throughout the State of Indiana. People who may not know where programs are located nearest to them didn’t know where to go to find this kind of information. This (marketing initiative) allows people to see all offerings and decide on a location and time that best meets their schedule,” said Bob Hobbs, Director of The New Castle Career Center. If you left high school before earning a diploma or need to improve your math, reading, or writing skills for employment, the HSE examination may be an option you want to pursue. The HSE credential provides proof to employers and colleges that you have academic skills equivalent to those of a high school graduate. The Indiana Region 6 Adult Education Consortium partnered with Muncie, Indiana-based marketing firm, McCormick-Dishman, LLC, to develop the company’s new brand identity. “The new website has quickly become a hub of information for all things Adult Education and High School Equivalency (HSE) in Region 6 of Indiana. It’s a one-stop location of information, FAQs and up-to-date class offerings,” said Tracy Dishman, CEO/President of McCormick-Dishman, LLC. “The website, partnered with a social media strategy and grassroots print campaign, allows the HSE information to be everywhere the customer may be looking for it”, said Dishman. Adult Education classes are designed to assist adult learners with preparing for the HSE exam. Adult Education classes are offered at various sites throughout Region 6 and there is NO COST to attend. Visit www.MyHSE.org for more details, class times, locations and contact information. McCormick-Dishman, LLC is a marketing and communications firm that partners with not-for-profit organizations to provide professional guidance on honing an organization’s brand, strategically crafting messages, and creating campaigns, websites, and printed materials that are easy to understand and move people to action. The Indiana Department of Workforce Development provides oversight to the Indiana Region 6 Adult Education Consortium.